Last summer I spent a few weeks with my kids at my parents home. They live on Lake Occoquan in Northern Virginia. We had lots of fun paddling stand-up paddle boards and taking rides on the boat. 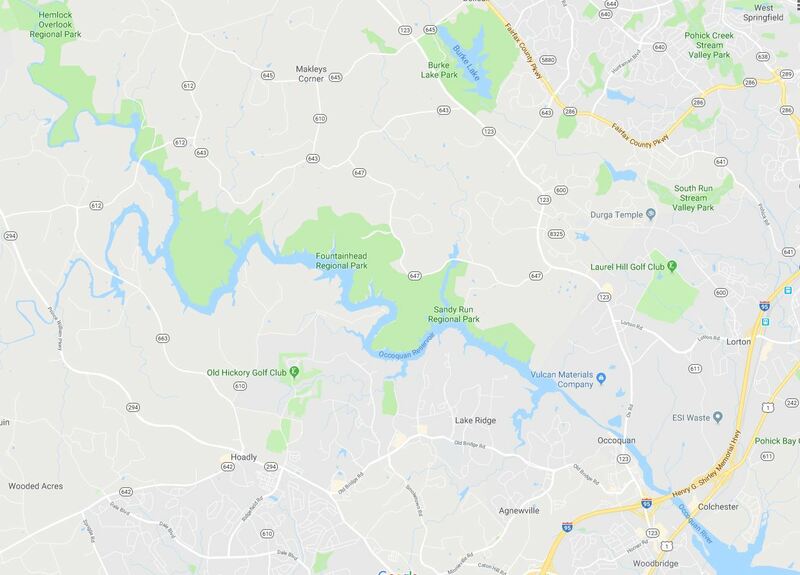 The Lake Occoquan Reservoir was formed in the 1950’s when 2 dams were built on the Occoquan River just east of the town of Occoquan, Virginia. The reservoir holds 10 billions gallons of water and supplies Fairfax County and half of Prince William county with drinking water. 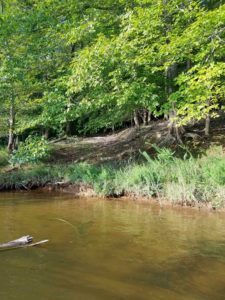 The Occoquan River begins where Bull Run and Broad Run meet. Bull Run is well-known because of the Civil War. 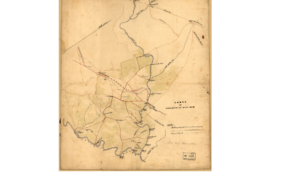 The First and Second Battles of Bull Run occurred further up the waterway from where my parents live. The battles were also referred to as the First and Second Battles of Manassas by the Confederate forces. 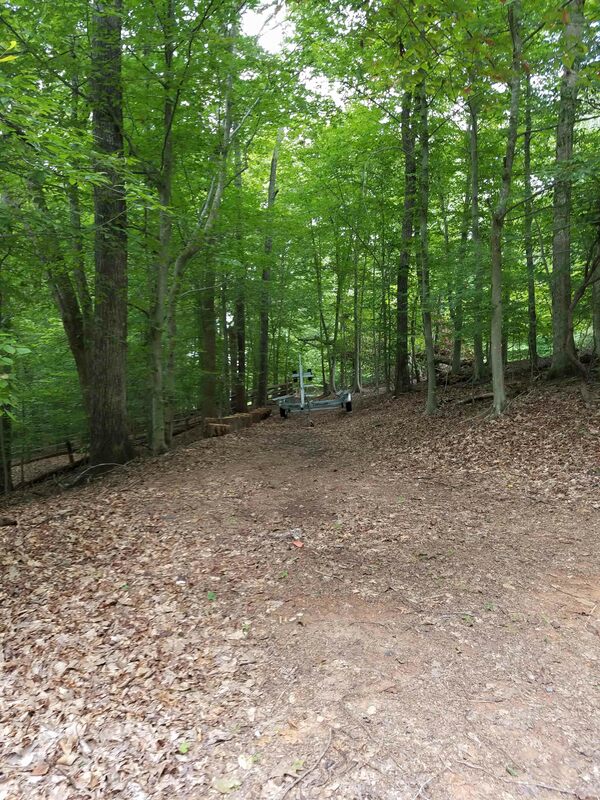 The area of land at the top of my parents driveway has a section of dirt road that runs across it with trees on either side. I am going to be a little vague about the name of the road in order to protect my parent’s privacy. The name of their street is the name of the river crossing (ford). My father has spoken to his neighbors and found out this small section of road was what was left of the old road from the 1800’s. It goes across my parents land and then is under the current paved road for a while. The dirt road then reappears on the neighbor’s land heading down to the water. A neighbor informed my dad this road was one of only a few safe places people could cross Bull Run in the 1800’s. Some people in the neighborhood have found Civil War rifle bullets. 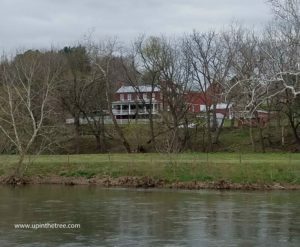 The story is there were skirmishes at the river crossing (ford) with the Union and Confederates firing across the river at each other. This past summer we made a cool discovery while out paddling on the river. 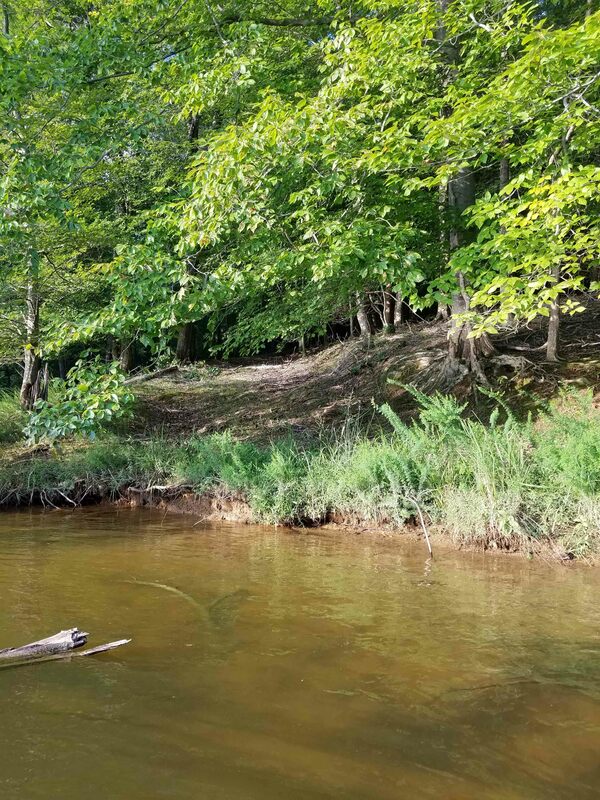 My dad, kids, and I had paddled up the river a little bit into a more shallow area that is off the main river. My kids have named this spot Pirate’s Cove. We paddle over there to search for pirates and treasure. The trees hang over the lake in this cove. I sat down on my paddle board for a minute to help kid #2. From this vantage point I could see under the branches. I realized I could see a cleared area. I moved my board to a different position in the cove and realized this was the other side of the dirt road. 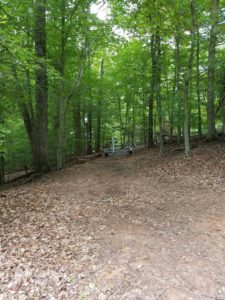 After wagons went across my parents land and Bull Run, they would have traveled back uphill at this point. After returning from our paddle adventure, I began googling for any information regarding the fords on Bull Run. 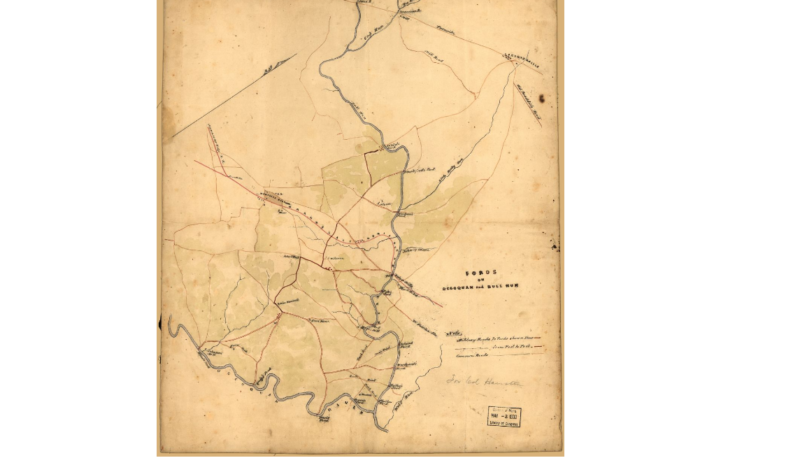 I was excited to find a Civil War map that has been digitized and available on the Library of Congress website. Library of Congress. 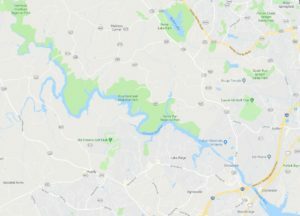 Fords of Occoquan and Bull Run. Sure enough, the crossing close to my parents house is on the map. According to this map, the ford by my parents house was a secondary route and not as well-traveled as the main road fords. This does not surprise me. The next ford up river is still the location of a main road today. In fact, as you drive across the current concrete bridge you can see remains of the old stone bridge that once was the road. The most likely scenario is that the ford near my parent’s house was in a very shallow location. This would have allowed wagons to cross without danger. I also located a 1901 map of Prince William County at the Library of Congress. The ford near my parents house was no longer on the map. Next summer we will return for another long visit. I hope to find time to explore the road up the east side of the river. I also plan to visit more of the local historical societies to see if I can find more information about the neighborhood and fords. I took a trip with the kids out to the beach to make some sand castles this week. While the kids were playing in the sand, I took a moment to feel the ocean. There is something about the ocean that I just can’t get enough of. The smell of the salt water, the calming sound of the waves lapping up on the shore, the wind on your face, and the feel of the sand between your toes is like heaven to me. I feel connected when at the beach. It is a kind of faith knowing that there is something bigger out there. My father being in the Coast Guard during my childhood probably had a huge influence in how I feel about the water. I grew up living on both coasts. When we lived in Huntington Beach, California you could ride you bike to the beach. We lived on Aquidneck Island in Rhode Island. This is the “island” in Rhode Island (it is the largest island in the state and where Newport is located). While living in Rhode Island, we saw water everyday. We also lived outside of Washington, DC during my middle school years. The ocean is about 3-4 hours from our Northern Virginia house but we would camp at Assateague Island each summer on the sand dunes. Summers during high school in Northern California always included beach days at Stinson Beach. And life was a beach while attending University of California San Diego. While enjoying the beach last week, it occurred to me that most of my ancestors never lived near the ocean. I come from Middle America farmers. Most likely, the only ancestors who saw the ocean where those who traveled across it to reach the United States. It was a WOW moment for me as I thought about the journeys they endured to get to the U.S. I wonder how they viewed the ocean? Was it just an obstacle for them to cross or was it an opportunity? Did they feel the same way about the water that I do? Did they get to spend much time outdoors when crossing the Atlantic or were they confined inside? How long was the trip from Europe to the United States? Time to do some more research! Photos taken 20 November 2007 of Will Book D by Sierra Pope. I Martin Strickler of the County of Page and State of Virginia do hereby make my last will and testament in manner and form following that is to say. 1st: I give and bequeath unto to my wife Anna Strickler during her life all of my house hold and kitchen furniture of every due scription (sic) and after her death I direct that the said property be sold at public sale and the money rising from the sale of said property is to be equally divided between my two daughters Rebecca Keyser the wife of Reuben Keyser & Nancy Foltz the wife of George Foltz. I also give and bequeath unto my wife Anna for and during her life one third of the farm I now reside on. 2nd: I give and bequeath unto my son David Strickler and his heirs for ???? the farm I now reside on subject to the third I have allready (sic) given to my wife Anna during her life after her death, my son David Strickler is to have the whole farm containing three hundred and fifty acres by survey be it the same more or less being the land I purchased of I Strickler by my son David Strickler paying out to my daughter Nancy Foltz the wife of Geo. Foltz five hundred dollars to be paid in two annual payments two hundred and fifty dollars to be paid in and one year after the death of my wife Anna and the remainder in one year after as ???? the above named five hundred dollars is intended to make my daughter Nancy Foltz equal with my daughter Rebecca Keyser which I have heretofore give my daughter Rebecca Keyser eighteen hundred dollars and my daughter Nancy Foltz thirteen hundred dollars. 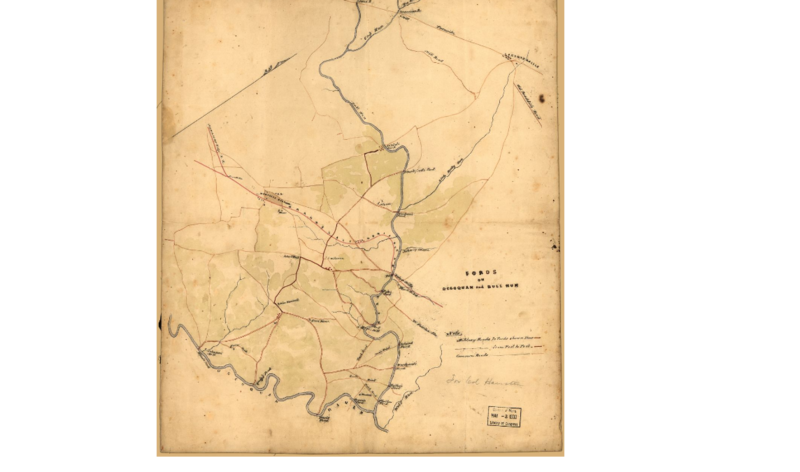 3rd: I desire and direct that my land lying on Stony Run shall be sold on the following conditions. Each tract shall be sold separate One tract I purchased of Jacob Aleshire containing on hundred acres be it the same more or less. One tract I purchased of George Aleshire containing forty eight acres bit it the same more or less. One tract I purchased of Emanuel Comer containing twenty five acres be it the same more or less I direct that my Executor hereafter mentioned shall sell as soon as convienent (sic) after my death the above named tracts of land on the following condition. One third of the money on each tract to be paid down and the remainder to be paid in three annual payments. And the money arising from the sale of the above named tracts of land it is my desire shall be divided equal between my two daughters Nancy Foltz & Rebecca Keyser. 4th: I give and bequeath unto Martin Propts the farm purchased of James Hollensworth containing one hundred and forty acres be it the same more or less I give the above named farm to Martin Propts even for a bond he holds against me for six hundred and sixty dollars (or perhaps over that amount) But if the said Martin Propts is not willing to take the above named tract of land for the above named bond I then direct that the land shall be sold by my Executors hereafter mentioned upon the same terms of the other above named lands. And after paying all of my just debts & expenses of settling my estate should there be any bonds left I desire and direct the remainder to be equally divided between my daughter Nancy Foltz and my daughter Rebecca Keyser. 5th: And lastly I do hereby constitute and appoint my son David Strickler and Wm M Dorrough Executors of this my last will and testament hereby revoking all other former wills made by me in witness whereof I here unto set my hand and seal this 4 day of September 1857. At a court here foresaid county on Monday the 27 day of October 1857. The last will and testament of Martin Strickler was presented to the court and proved by the oaths of Moses Hent?? And Daniel Kite two of the witnesses thereto and is ordered to be bound and on the motion of David Strickler and Wm M Dorrough the Executors therein named who made oath thereto and together with James Kibler and Chesebim (sp?) Hershman as their securities entered into and acknowledged on bond in the penalty of $5000 conditioned according to & in a certificate is granted the said David Strickler and William M Dorrough for obtaining a probate of the said will and testament. Abraham Strickler was born at home along the banks of the Shenandoah River South of Luray, Virginia on October 24, 1853. 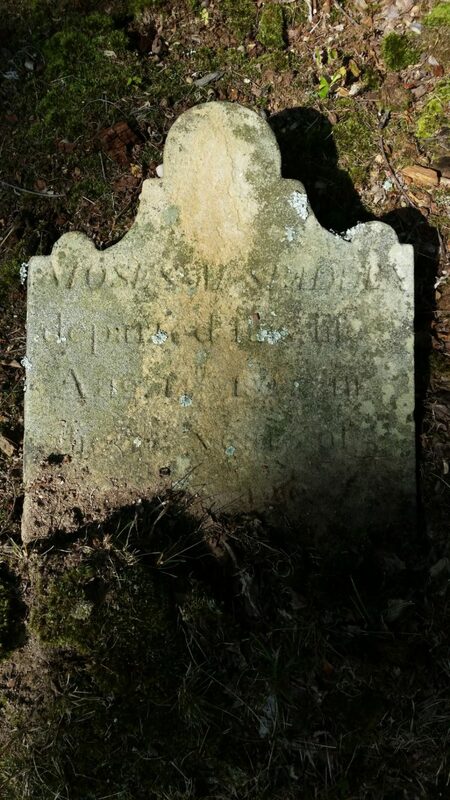 The Strickler family was one of the original 8 families that settled what is now Page County, Viginia in the 1730’s. The original Abraham Strickler who settled the area would be this Abraham Strickler’s great-great grandfather. 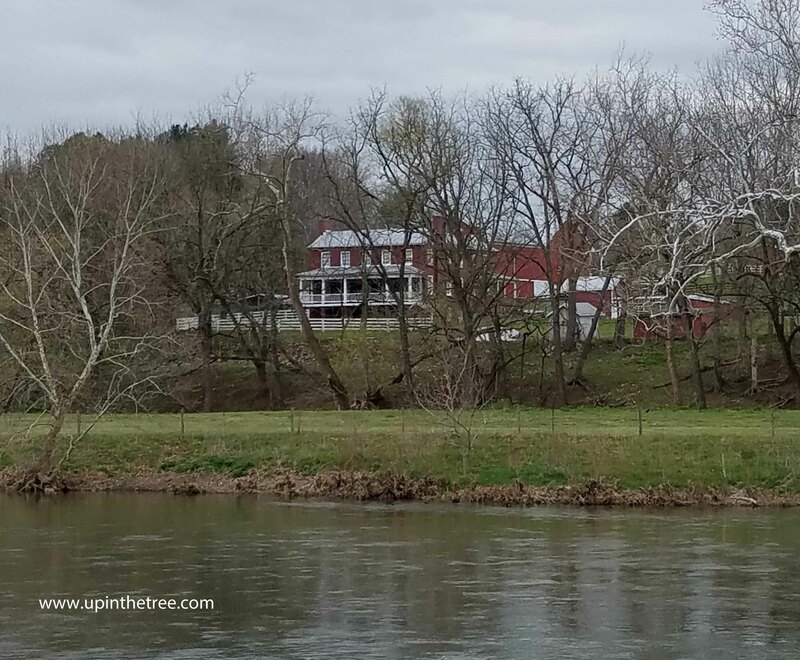 Abraham’s great-grandfather, John was granted the 230 acre family farm on the Shenandoah river. John’s son, Martin (Abraham’s grandfather), bought out his brothers upon John’s death to own the entire farm. He later bought adjoining property to bring the farm to 350 acres. Abraham’s father, David Strickler, was running the famliy farm at the time of Abraham’s birth even though his father, Martin was still alive. Abraham’s grandparents, Martin and Anna, lived in the original family home next to the Abraham’s family. David built the fancy ‘new’ brick family home in the years immediately before Abraham Strickler’s birth (1851-1852). Abraham was the youngest of 10 children, 5 girls an 5 boys. 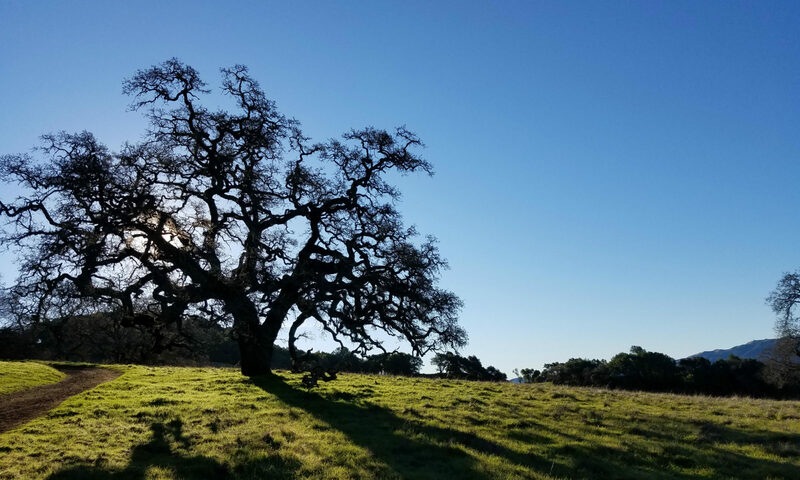 The family was wealthy, living on 350 acres of land. Even though most of the farm work was done by the sons and hired hands, the family did have 1 slave. Abraham’s first marriage was to Emma Dovel on December 24, 1874. Abraham and Emma were 22 and 21 years old when they married. Emma lived on a nearby farm run by her father. The Dovel’s were another founding family of Page County. Abraham and Emma had one son, David Walter Strickler, in March 1876. The son’s obituary indicates that Emma died in Kansas City, Missouri when the family moved there a couple of years after he was born. I found both Abraham and David living with Emma’s family in the 1880 census in Page County, Virginia. At the time of the census, Abraham is 26 years old and David is 4 years old. Apparently, they had decided to head back to Virginia after Emma’s death. Sometime between 1880 and 1885 Abraham left his son in Virginia with his deceased wife’s family and he headed to Kansas again. He was enumerated in the 1885 Kansas Census in the town of Albion, Republic County, Kansas as a farmer living with one of Emma’s brothers, Benjamin. There is no documentation that shows Abraham kept in touch with his son. David Walter Strickler’s obituary mentions that he moved in with his aunt’s after his mother’s death. It appears that the family lived on two different farms when the children were little. Both the Federal census in 1900 and the Kansas Census in 1905 shows that Abraham owned the farms he worked. The family first lived in Narka, Republic County (about 1888-1900). They were in Haddam, Washington County when their youngest daughter was born. They lived in Haddam approximately 10 years before moving in 1908. 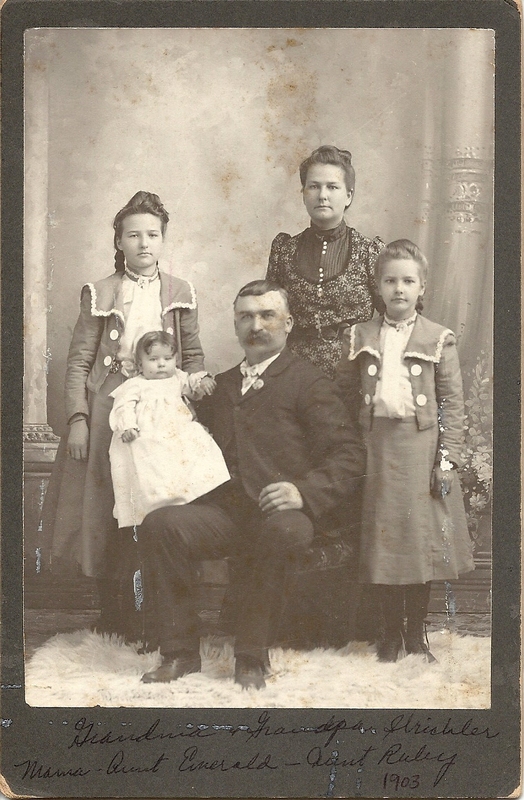 In 1908 the family moved to Fall River, Kansas. This was a big move as Greenwood County, Kansas is approximately 250 miles southeast of Haddam, Kansas. I have not found any documentation that indicates why the family made the move to southern Kansas. 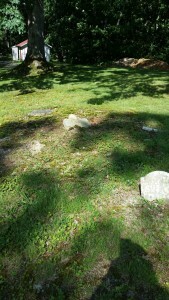 According to Abraham’s obituary, he quickly became invovled in the community in Fall River. He purchased the Rodgers Hotel in town and an interest in the Fall River Creamery. He also purchased a farm outside of town that he worked. The family lived in a home in the town of Fall River. Unfortunately, Abraham had a stroke in October 1909 at the age of 56. He was not well after the stroke and died 4 months later on March 23, 1910. 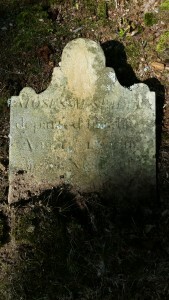 He was initally buried in the North Pole Cemetery, south of Fall River. On a trip to Kansas in October 2010, I was surprised to find Abraham Strickler buried next to his wife Effie in Topeka, Kansas. Effie had remarried in 1914 to John Scott and was widowed a second time before the 1920 Federal Census. Effie was again remarried in 1931 to her third husband. She died in 1939 still married to Daniel Hogbin. The Penwell Gabel Cemetery in Topeka was able to locate records that show when the cemetery opened Effie bought 6 plots on July 1st, 1925. There is a letter dated January 5, 1926 asking Effie for payment of $5.00 for meeting her husband’s coffin at the train. Effie had Abraham disinterred from his grave in southern Kansas so that he could be near to her in Topeka. Abraham was the 50th person buried in the cemetery in Topeka. Effie and Abraham are buried next to each other.